It took me more than 20 years to finally “get” Moab. During my first couple decades living in Utah, when it was time for an escape, I’d usually flee to places like Paris, New York City, Provence, wine country or a beach somewhere. I didn’t really have much interest in southern Utah. Well, that has changed. This year, in particular, Moab began to occupy a large place in my heart and my head. Of course, places like Arches National Park, Canyonlands, Castle Valley, Fisher Towers, the Colorado River and a multitude of other natural mind-blowing attractions are Moab’s main draw. But increasingly, so are its restaurants. During a recent visit, for example, I had a superb meal at Desert Bistro, which might just be Moab’s best restaurant for fancy food. I also adore Eklecticafe, with its properly eclectic menu and the best cheesecake this side of the Hudson River. The River Grill Restaurant at Sorrel River Ranch is excellent, Paradox Pizza has pies worthy of the most discriminating East Coast-er, and 60-year-old Milt’s Stop & Eat offers bodacious burgers, fries, homemade chili and the best milkshakes in the galaxy. 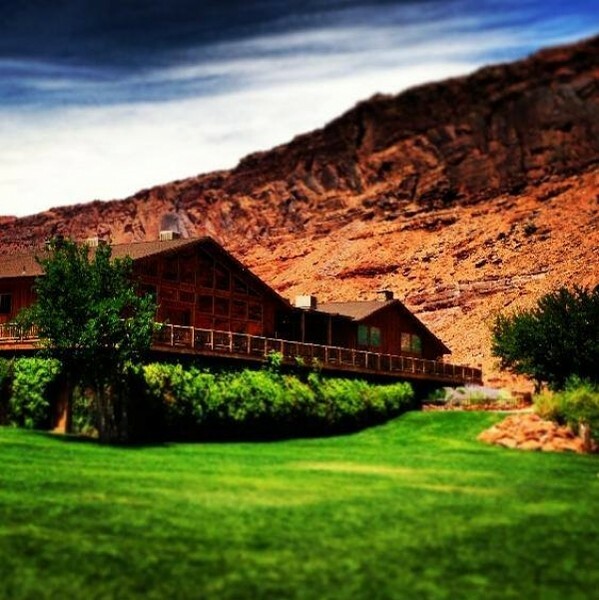 For a home base away from the actual town of Moab, Red Cliffs Lodge is hard to beat. It’s situated in Castle Valley, just around the bend from Castle Rock and a gorgeous 20-minute drive from town. The Western-themed lodge—with its 30 riverfront cabins and working horse ranch—will certainly bring out the cowboy in you, as it did for me. I’ve stayed in hotels and resorts all around the world, but I literally have not found a place more hospitable than Red Cliffs Lodge. Guests are greeted with a warm dose of what I can only call “Western hospitality.” It begins with the lodge’s owner, Colin Fryer, who is usually on the premises and is the most humble and hospitable resort owner I’ve ever met. If you’re lucky, he’ll be around when you visit one of his true loves: the Moab Museum of Film & Western Heritage at Red Cliffs Lodge. This really was a labor of love. Fryer rescued hundreds of artifacts, set pieces, costumes, props and such from films made in and around Moab and built a museum around them. With relics from Moab-filmed movies ranging from Rio Grande and Easy Rider to Forrest Gump and Austin Powers in Goldmember, there’s something for everybody. Oh, and admission is free. The Western theme is continued at Red Cliffs Lodge’s Cowboy Grill, a great destination for meat-loving buckaroos if I ever saw one. My family and I had worked up huge appetites—not to mention tender tushes—during a four-hour horseback ride led by Red Cliffs Lodge’s handsome and affable wrangler, James Dixon, who’s been with the Lodge since Day 1. Despite loving our scenic trail ride, we were more than ready to dismount and settle into some comfy chairs on the outside deck overlooking the Colorado River. As mentioned, we were starved. However, if it fits into your schedule, I recommend a pre-dinner libation at the Lodge’s Wild Horse Bar, situated next to a ginormous 20-foot rock fireplace. Warmly greeted and quickly seated by a Cowboy Grill manager named Wendy—who also happens to be the aforementioned James Dixon’s sister—we took a scenic spot on the deck. A terrific server named Noel promptly appeared, inquiring about water preferences and taking drink orders. “Noel, as in ‘Coward?’ ” I asked. “Yes,” said Noel, adding, “and thank you for knowing that name.” Turns out, Noel is an actor, one of many in movie-making Moab. Castle Creek Winery is located at Red Cliffs Lodge, and so, thinking “When in Rome,” we ordered a chilled bottle of Castle Creek Chardonnay. It was the first Castle Creek wine I’d tasted in quite a while, and I was pleasantly surprised. Meanwhile, we could have eaten a horse, but didn’t, instead opting to share some Cowboy Grill appetizers. I regret that I couldn’t talk anyone at my table into the “bull fries” (Rocky Mountain oysters). Instead, we enjoyed the cowboy kebab, which turned out to be a generous serving of three skewers of grilled beef, red onion, peppers, squash and mushrooms served with teriyaki dipping sauce. We also shared a ceviche of tilapia and shrimp in a tomato-based sauce—not my favorite. Next time, I’ll definitely go with the Rocky Mountain oysters. As mentioned, meat is the main attraction at Cowboy Grill, and options range from the house specialty Prime rib to lamb chops, pork chops, barbecued pork ribs, beef steaks and elk medallions. However, there’s also chicken, fish and even vegetarian choices, such as a veggie stir-fry, veggie kebabs and a grilled Portobello mushroom. Elk medallions at Cowboy Grill are excellent: tender and rich, and served with sauteed vegetables, a choice of side (baked potato, mashed potato, dirty rice, etc.) and warm fresh bread. I can rarely resist a rib-eye when it’s on the menu, and my 16-ounce boneless rib-eye steak was cooked to perfection: exactly medium-rare, as ordered. Also beautifully cooked and delicious was my wife’s Ruby Red Creek trout, which was coated in a light breading and broiled until just flaky, but not dry. There was added entertainment on the deck in the form of a bat show, which apparently occurs regularly on warm summer nights. They didn’t get near the tables, but somehow those crazy flying bats just added to the Western magic of Red Cliffs Lodge.